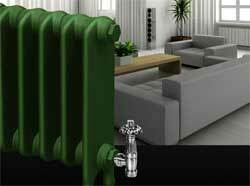 Thinking of changing your cast iron radiator for a modern steel or aluminium radiator? Find out all about their advantages and disadvantages, from efficiency to installation. 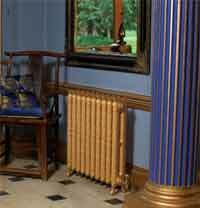 Although cast iron radiators tend to be more expensive than modern steel or aluminium they do have several advantages including the heat output compared to their size, their ability to blend with surroundings, especially within period properties and also the fact that they can be customised to provide a more modern look and feel. With the re-emergence of the cast iron radiator over the past few years the choice between installing cast or modern steel radiators raises some interesting questions and points of thought. The use of Cast iron is definitely an old idea but when compared to the other options available (e.g. steel and aluminium) they are still more than a worthy contender, proving still to be the best on several fronts from efficiency to aesthetics. For period renovations such as barn, church or warehouse conversions and extensions the cast iron radiator is certainly the better choice to compliment the age of these buildings and provide sufficient heat output to heat these spaces comfortably. You might be thinking "why would that be?" Cast iron is an excellent conductor of heat and therefore works far better in larger spaces with taller ceilings. Although they do tend to take quite a bit longer to heat up due to the density of cast iron as a material, once at temperature they retain that heat much longer than any other radiator type. When considering the space a radiator will take up versus it’s heat output – a cast iron radiator will take up much less wall space than it’s equivalent modern steel or aluminium counterpart. When thinking about this, in order to get the best out of a modern radiator (or any radiator for that matter) it needs to be in contact with the air within a room in order to heat it and in order to do so needs to be placed in a central location in a room. When you look at wall space within the majority of houses these central, accessible walls tend to be "premium areas" where you want to put things like sofa’s, TV’s, beds, cupboards etc…. and if you have a bed or a sofa in front of a radiator it’s not going to heat a room space efficiently as it will be pumping all it’s heat into the item that’s covering it and not into heating the room, wasting you money on heating costs and still leaving you with a cold room. So when thinking along these lines, if you can have a radiator that is smaller and not only provides the equivalent heat output of one of it’s modern counterparts but can also become a feature of the room itself, as lets face it the modern radiator is not exactly one of the most attractive items in the world, a cast iron radiator could tick 2 boxes in this case. In many cases cast iron radiators are offered custom built to the exact size, heat output requirements, colour and in many cases also design for each room space and with many companies now emerging into this market, most offer a quick turn around in terms of construction and delivery, many within 7 days of order and ready for installation. The above is not so easy with the more modern radiator as most are available in a set number of sizes and in terms of colours, you can re-paint, but the finish is not amasing unless you get them sprayed which again comes at an additional cost. Cast iron radiators have thicker walls than conventional steel or aluminium panel radiators, and they also heat up slowly, which in some respects can be a bit of a disadvantage if you are wanting to heat a space quickly but as mentioned above they do hold heat far longer, giving you more of a consistent and ambient heat output that also lasts a lot longer once a heating system is switched off. As mentioned, steel and aluminium radiators will almost certainly heat a room much quicker than a cast iron radiator as they tend to give a quick blast of heat but as they also lose temperature very quickly your heating pump and boiler have to work quite a bit harder to keep your property at temperature whereas with a cast iron radiator, they retain heat for much longer and don’t put so much strain on your heating system components. Cast iron radiators are very efficient when coupled with natural heat sources such as Air Source and Ground Source Heat Pumps due to their excellent heat conductivity. Due to the conductivity of cast iron, the heat transferred into your room is much better at keeping them at a consistent temperature giving you a more efficient and comfortable heat. What Does all the Above Mean? Originally, cast iron radiators were seen as the most efficient radiator for period homes only, however as we have all become more environmentally aware in the past few years, with efficiency being an ever increasing important factor to consider, the cast iron radiator has enjoyed a major revival in popularity and has become a desirable feature taking pride of place in living areas within both the modern and period homes due to their efficiency, especially when coupled with environmentally friendly heating systems. Many contemporary homes today are also choosing cast iron as opposed to modern steel as they are both installed in the same manner, they are also space saving, beautiful to look at and last far longer than the majority of their more modern equivalents. Cast iron radiators, with a well chosen colour scheme, can add dimension to a modern room and provide an attractive focal point. As cast iron radiators are still quite a re-emerging product, in most cases they are going to be more expensive that your standard steel or aluminium panel radiator but when you consider the possibilities of efficiency and the money that can be saved and their longevity, cast iron radiators should always be a consideration. With period renovations the cast iron radiator comes in a choice of different period styles befitting the Edwardian, Victorian, Regency or Art Deco home, unfortunately the modern steel radiator tends only to compliment the contemporary setting. Reputable cast iron radiator companies are now offering paint effects to enhance their beauty such as antiquing and high lighting detail to compliment historical room decor. The mindset that cast iron radiators are old school and inefficient is rapidly diminishing as today’s market is increasingly understanding and experiencing their efficiency and beauty.